*Please include the name(s) of up to three other individuals whom you would like to receive a one-year pass. *Please choose the t-shirt colors available on the online store. *Membership in no way implies actual participation in the rescue, rehabilitation, and/or release of sea turtles and is a non-voting membership. 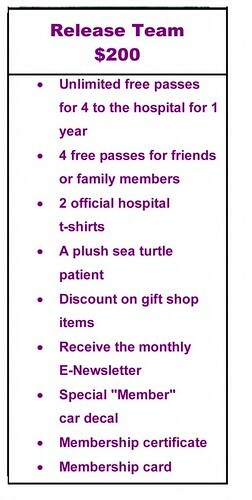 *Must have photo ID and membership card for free visits and gift shop discounts. Reservations are required. Memberships are made on an annual basis, with an option to renew.